Najomtien officials raided 10 illegal food and recreation stalls that had set up shop on public land that were allegedly annoying locals with excessive noise. Sub-district Mayor Sompong Sainapa, Moo 2 Village Chief Somnuk Kabkhan and Najomtien Police Superintendent Col. Kiatpong Namla went out to the Sattahip beachfront area May 9 after complaints that merchants had erected shacks and more-permanent structures on public property and were offering food, drinks, foot massages and rentals of jet skis and powered paragliders. Officials set upon illegal shops set up along Najomtien Beach with the intent of having them removed. 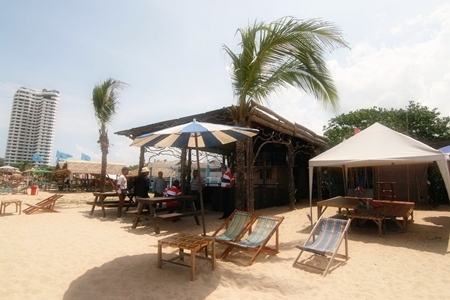 Like others working the beach, an unnamed staffer at the Jet Ski Bar, the largest and sturdiest of the structures, denied ownership of the stalls. None of the businesses had deeds showing ownership or lease of the beachfront, nor licenses to operate. Kiatpong photographed the offenders and their shops and Sompong directed sub-district workers to look into demolishing the shops. Najomtien crime suppression chief, Surachet Kaewkam, said the raid inspired urgent phone calls from the actual, also unnamed, owners, who allegedly claimed that personal connections in government had given them permission to set up on the beach. Sompong said, however, that not only were the shops illegal, the gas-powered paragliders were noisy and destroyed the peaceful atmosphere on the beach. Therefore, he said, he rejected the supposed owners’ pleas and carried on with eviction plans.